Last Thursday I gave the keynote speech for the American Heart Association’s Go Red for Women luncheon at the Charlotte Convention Center. 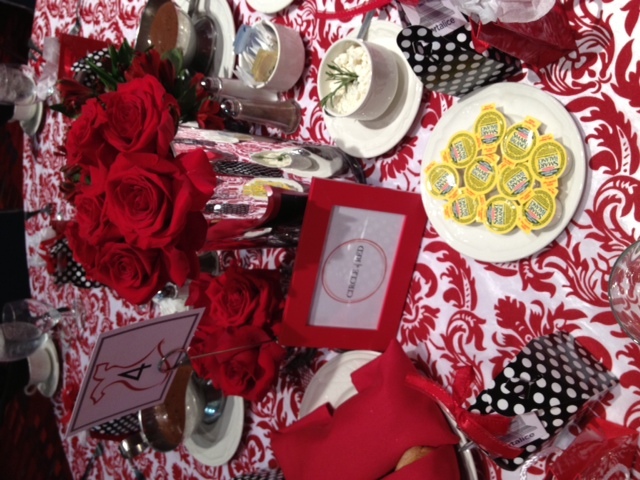 It was a gorgeous event with over 750 people dressed in all shades of red supporting heart disease prevention. I rarely wear such bright colors but loved my fun dress for the event! I was asked to tell my story on how the Count Me Healthy bracelets were born and how the wellness goals women can track on the bracelets also relate to heart disease prevention. Cardiac issues in women are 80% preventable with healthier lifestyle changes. 80%! Huge. But the bulk of my speech was this…Thing is, we are given so much information on how to live better longer lives through diet and exercise. We are inundated with excellent, healthy information! Society has done a fabulous job on creating awareness, but then how do you implement the lifestyle changes on a consistent basis so that it creates lasting, positive results? Add M&Ms to your diet. The healthy kind of M&Ms: Motivation and Mindfulness. If you are mindful and motivated your health goals are much more likely to become habit. To truly be happy and accomplish your goals, be it work, health, relationships, you have got to stop comparing yourself to those around you. If you do this, then when, in your mind, you don’t measure up to the ideal you are aiming for…you quit. Nobody knows what is going on in the other person’s life. Instead of focusing on how beautiful, thin, together, rich, etc someone else is, take inventory of your self worth. Then think what health goals you want to accomplish to help you become a better YOU. Appreciate the current moment. A great prayer to God or if you believe in any higher power is “Thank you.” When you truly appreciate the present moment it’s so much easier to stay motivated. 3rd M&M: Don’t start any sort of lifestyle you don’t like or you don’t think you’ll stick with. How can you be mindful and enjoy living in the moment when all you want to do is get out of the moment? By lifestyle, I mean diet and exercise. If you can’t stand meat, don’t try to go on Atkins. If you don’t ever feel satisfied after a protein shake then don’t attempt to purchase $300 worth of Tracy Anderson powdered protein shakes. If you never liked to run and don’t enjoy it, then don’t force yourself to do it. I have a girlfriend who is so gorgeous and swears by weight lifting. I can’t stand it. I’ve tried it, and I feel much better after a run or a pilates workout. Everyone is different. Create a healthy lifestyle that you love and you will adopt it long term.